5,000 years ago, the Yamnaya culture migrated into Europe from the Caspian steppe. In addition to innovations such as the wagon and dairy production, they brought a new language – Indo-European – that replaced most local languages the following millennia. 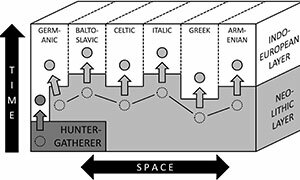 But local cultures also influenced the new language, particularly in southern Scandinavia, where Neolithic farmers made lasting contributions to Indo-European vocabulary before their own language went extinct, new research shows. Most historical linguists agree that words such as ‘wheel’, ‘wagon’, ‘horse’, ‘sheep’, ‘cow’, ‘milk’ and ‘wool’ can be attributed to the Yamnaya people who migrated into Europe from the Caspian steppe 5,000 years ago. The nomadic and pastoral Yamnayans introduced their material culture to the local peoples through a new language known as Proto-Indo-European, from which most European languages descend. 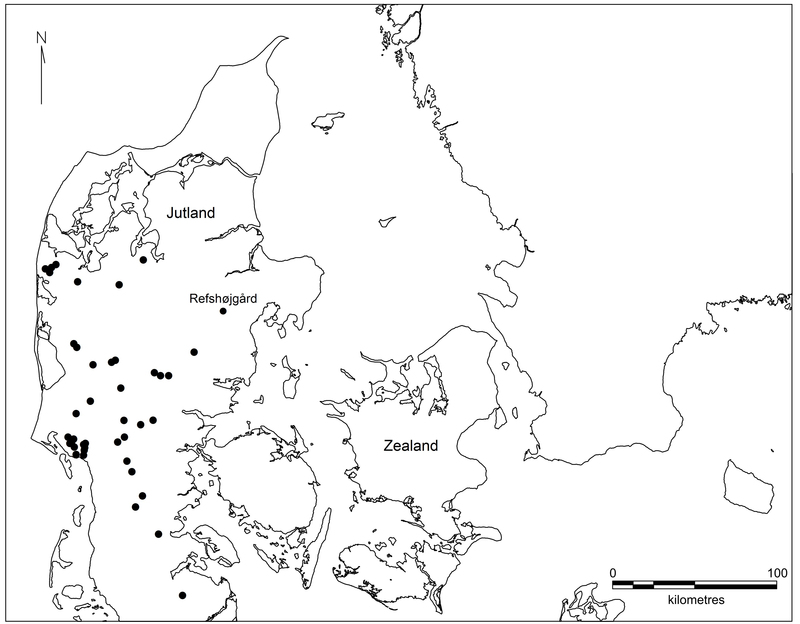 Distribution of the earliest Single Grave culture burials in southern Scandinavia, ca. 2850–2800. The Single Grave Culture co-existed with the local Funnel Beaker Culture, which inhabited the island of Zealand, for 200 years. Click on the picture to enlarge it. “The archaeological evidence tells us that between 2,800 and 2,600 BC two very different cultures co-existed in southern Scandinavia: there was the local, Neolithic culture known as the Funnel Beaker Culture with its characteristic funnel-shaped ceramics and collective burial practices and the new Single Grave Culture influenced by the Yamnaya culture. The Funnel Beaker Culture was eventually superseded by the Single Grave Culture, but the transition took hundreds of years in the eastern part of southern Scandinavia, and the two cultures must have influenced each other during this time, “says archaeologist Rune Iversen, who has specialised in this particular transitional period. 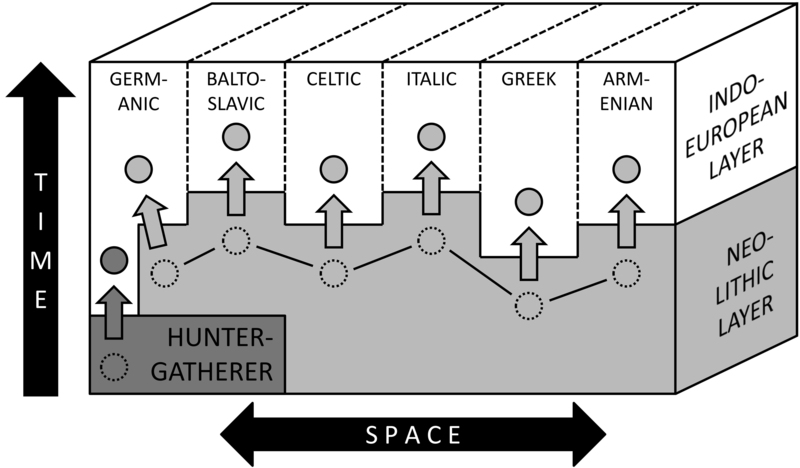 Schematic impression of how the different Indo-European branches may have absorbed lexical items (circles) from previously spoken languages in the linguistically complex setting of Europe from the third millennium BC. 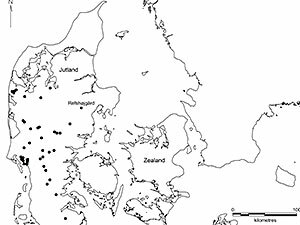 Read Rune Iversen’s and Guus Kroonen’s paper Talking Neolithic: Linguistic and Archaeological Perspectives on How Indo-European Was Implemented in Southern Scandinavia in American Journal of Archaeology.